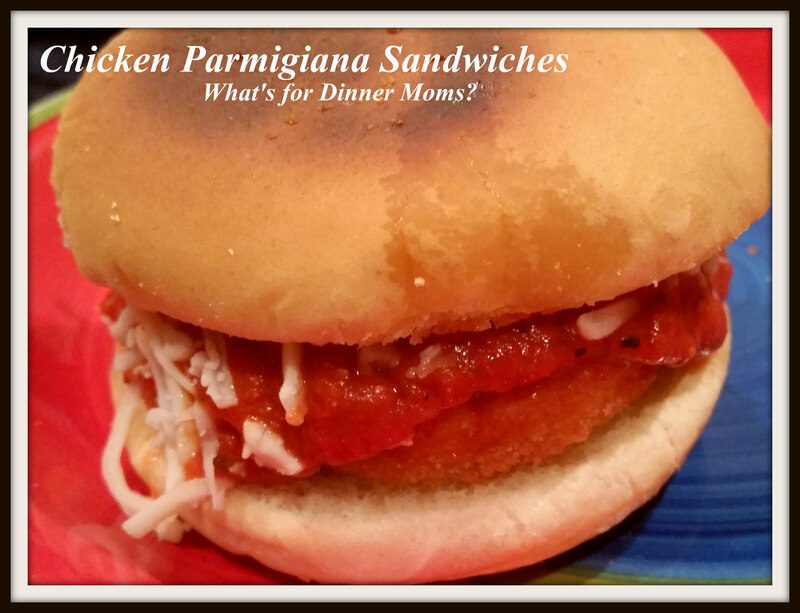 A Plan B Dinner – Chicken Parmigiana Sandwiches on Garlic Bread Rolls – What's for Dinner Moms? We all have those nights. Last week I told you about my daughter burning dinner (and my favorite pan) and the freezer leaking all over the kitchen floor. That night we ordered out. Emotionally there are nights I just can’t deal. But, most nights I have a Plan B in the background. When I do my monthly grocery shopping I plan 2 – 4 simple meals that can be pulled out at a moments notice. I needed one of those the other night. I had texted my partner to please take out chicken breasts and one other meat from the freezer so that they were defrosted for dinner the next two nights. I opened the refrigerator at 5:30 pm to start making chicken chili for dinner and there was NO meat in the refrigerator. I looked around thinking well, maybe she forgot and left it on the counter? No. No meat. Crud! So, back up plan. I sent my daughter to the basement to pull out a bag of chicken patties that were in the bottom of the freezer waiting to be used on a night like tonight. A jar of sauce or some homemade sauce with mozzarella cheese and hamburger rolls made into garlic bread and dinner is made. Do you have a back-up plan for when things don’t go as planned or you need to make dinner quickly without much thought? It could be breakfast for dinner (do you have a dozen eggs in your refrigerator? ), soup (pull out one of the frozen containers from the last time you made soup and doubled it) or even sandwiches (do you have bread or rolls to use). Keeping a few things on hand can save you from expensive ordering out or going out to eat. My family actually really liked the sandwiches. I had asked if they wanted a side of spaghetti instead of the rolls and they said no. But, during dinner they both decided that next time this happens they want to try making the sandwiches with spaghetti right on the sandwich. I wonder if I am creating extreme foodies in my family? They especially liked that I put butter and garlic on the rolls and baked them in the oven for a few minutes to make garlic bread with them. I served these with a side of carrots and a green salad. Since I have a large family (I also work from my home/office) I’ m extremely organized and cook, bake, create, write recipes non stop. In my early married life things were not so organized (even though, I was raised in a large household where my Mother cooked daily and my Father owned a restaurant that I worked in). Keeping in mind everyone’s taste, nutritional values, caloric intake I know in advance what I am making. I shop weekly (today-Wednesdays) at grocery, specialty markets. Its not always easy Marci but I think you do an outstanding job! My kids are so picky..they want the same thing over and over again. If I made this they wouldn’t even eat it smh. I don’t know what to do..
My son is Autistic and has become a fearless taster. It didn’t happen overnight. When I decided to make the switch that they would not end up as beige eating children (white bread, chicken nuggets, fries, etc…) I made sure there was one thing they would eat at each meal. Whether it was a salad, vegetable or some such item. They had to take a “No Thank You” helping if they didn’t want to eat a normal portion – varied from 3 carrot slices to a tablespoon of a casserole and eat it. I also allowed one food we could each choose to say NO to. It gave them some control. Even if they didn’t like a dish I would ask them to explain to me why. It is gross was not acceptable. I started to give them words like texture, – I don’t care for the texture. I prefer it to be chewier. Or they could say It is bland I would like it with more salt or flavor. This gives them a voice. I would still cook the meals and still offer the foods. After awhile they started to shift. No Thank You helpings became fewer. It took a LONG time but for me it was worth it. When my daughter was in Germany this summer and texted me she had just tried Ox I was incredibly proud of her because she was one of only 2 students to do it. We make a lot of chicken for dinner, and sometimes (when it gets old) we throw it on a roll with sauce and shredded cheese! It sounds even better with the garlic bread, though. That was a how do I save these rolls that are kind of bland and about to go stale. Looks soooo good! I’ll definitely be trying this some night. Thanks for sharing! Thank you! And you would be most welcome! I totally have backup plan meals in the freezer! I never know how busy my work day will be and sometimes don’t have time to start prepping to cook earlier. The sammies were a great idea! Thanks. So many people don’t even think about dinner until it is time to eat! I remember the days I did this. Great memories.